This is the Club’s signature hole with two attractive cross bunkers cut into the side of the slope leading up to the half-way point on the course. 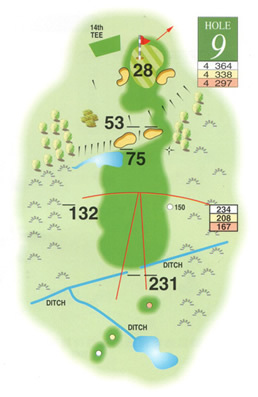 A good drive is required over two cross ditches and often into a coastal breeze leaving a medium iron over the cross bunkers onto a raised green which slopes from back to front. Normally one club extra is a helpful tip to ensure holding the putting surface with bunkers left and right. The green is at the high point on the course exposed to the wind and tends to harden which makes putting downhill a test of nerves but par is a welcome outcome.